Jim Enright, MAP-Asia’s Coordinator, recently attended a “Regional Workshop on Catalyzing Incentives for Sustainable Management and Restoration of Mangroves in Asia and the Pacific”, Oct.29-31, 2012 held in the coastal city of Beihai, in the south part of Guangxi, China. The workshop was sponsored and organized by Asia-Pacific Network for Sustainable Forest Management and Rehabilitation (APFNet) based in Beijing, China which is an initiative of APEC economies launched in 2008 to enhance capacity building and information exchange in the forestry sector in the region. This was the first opportunity for MAP to meet and dialogue with APFNet which adds to our regional network. The workshop was by co-sponsored by IUCN, PEMSEA, ITTO, TNC and WWF. Workshop participants came from China, Cambodia, Myanmar, Thailand, Vietnam, Germany, UK, and Mexico. 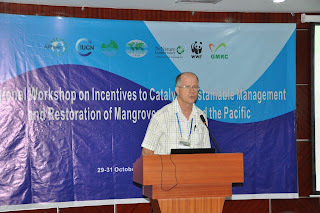 presenting at APFNet mangrove workshop in Beihai, China. Jim presented on “MAP’s Experience Using Ecological Mangrove Restoration: Re-establishing a more biodiverse and resilient coastal ecosystem with community participation” The presentation was well received and for many participants the EMR methodology was very new as most projects involve the use of plantations and afforestation on the extensive mudflats in China. There is not a great deal of mangrove forest habitat remaining in China, and presently less than 23,000 ha. 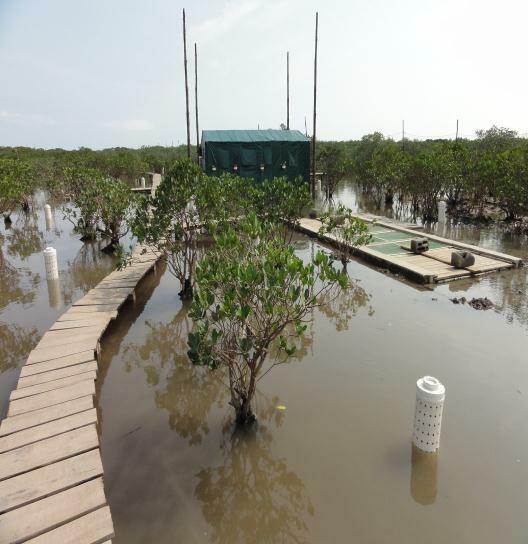 During the 1980s shrimp farming was the cause of 97% of mangrove loss. The final day of the workshop was a field trip which was organized and facilitated by the Guangxi Mangrove Research Center (GMRC). The field trip included visits to GMRC, to the new city of Fangchenggang under construction where a few ha of a dense stand of mangroves have been conserved and incorporated the Marine Cultural Park, as a result of a lot of lobbying and protesting by environmental activists. The highlight of the trip was to see a new concept called Mangrove Eco-farming at the Beilun Estuary Nature Reserve which involves an underground piped water system. The first trails of this unique eco-farming system were undertaken by GMRC in 2007-08 to raise fish, clams and crabs. The system is quite expensive with the infrastructure costing between $19,000-28,000 per ha. The benefits are the system uses native species, no artificial feeding, has high survival rate of animals, a high recapture rate with a higher economic return from 750~1125kg/ha/year of seafood. The eco-farming system would probably only be applicable in China where the mangroves are sparse and allows for the excavation to install the piping without damaging the mangrove roots and China has a high end market for local fresh seafood. The workshop also presented an opportunity for MAP-Asia to meet partners PMCR from Cambodia and MSN of Myanmar and representatives from groups in China who have had some past communications with MAP over the years, including representatives from the Zhanjiang Mangrove National Nature Reserve (ZMNNR) of Guangdong Province and China Mangrove Conservation Network (CMCN) based at Xiamen University, Fujian. 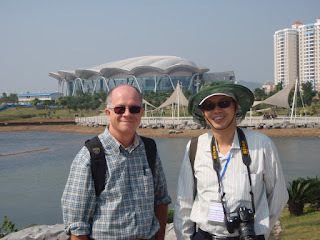 MAP’s Education Director, Martin Keeley, is now in the process of working with ZMNNR to have the Marvelous Mangrove Curriculum introduced into the school system in area of the reserve and has plans to give a training workshop for CMCN at Xiamen in Dec. 2012. The APFNet workshop was also a great opportunity for MAP-Asia to make a number of new contracts. Jim was surprised and happy to meet Dr. Weidong Han, Professor at Zhanjiang Ocean University at the workshop. 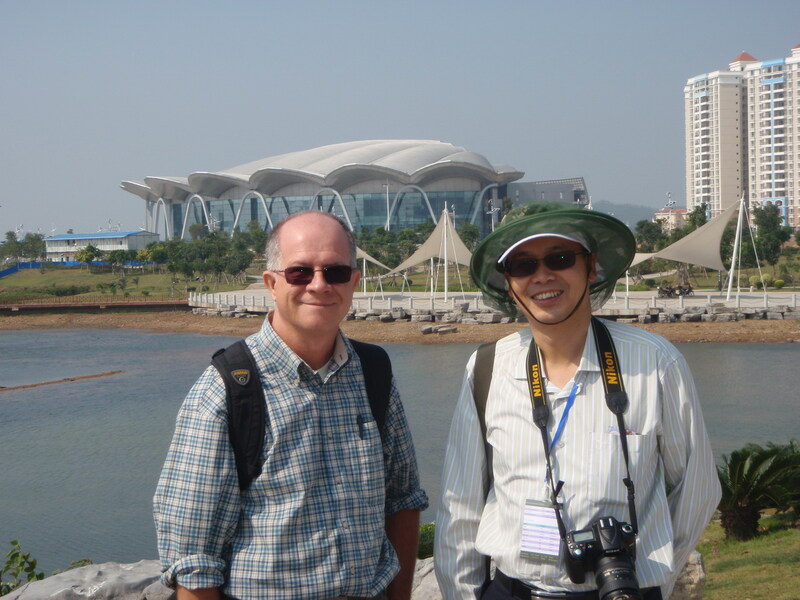 Dr. Han had hosted MAP’s Executive Director, Alfredo Quarto and Jim on their first exposure visit to the mangroves of the Leizhou Peninsula, Guangdong in 2003.
and Dr. Weidong Han of Ocean University, after almost a decade.